The Philadelphia Flyers have signed 6-1, 200-lb defenseman Nick Schultz to a multi-year contract extension, according to general manager Ron Hextall. Schultz, 32 (8/25/1982), has appeared in 55 games for the Flyers this season, recording two goals and 11 assists for 13 points. He has already recorded his highest point total in a season since 2010-11, when he had 17 points (3G, 14A). Schultz has also picked up 33 PIM this season and is a plus-6. 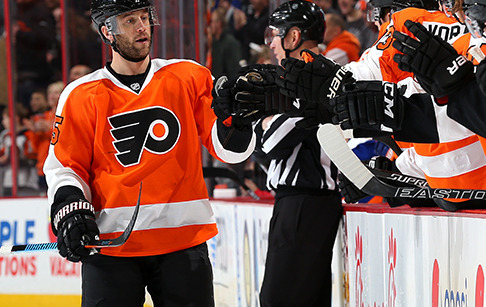 Schultz originally signed with the Flyers as a free agent on July 2, 2014. He previously spent time with Minnesota, Edmonton and Columbus. He split the 2013-14 season between the Oilers and Blue Jackets, posting five assists and 28 PIM in 69 total games. The Flyers host the Buffalo Sabres tomorrow night, and will induct Eric Desjardins into their Hall of Fame prior to the game. Their current homestand continues this weekend with games on Saturday vs. Nashville (1pm) and Sunday vs. Washington (12:30 PM). Tickets and information are available at philadelphiaflyers.com.